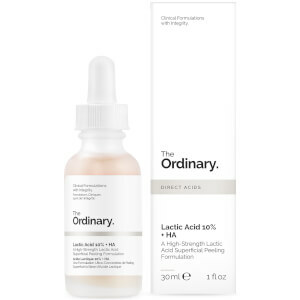 Transform skin with The Ordinary AHA 30% + BHA 2% Peeling Solution; a powerful resurfacing treatment that acts as a ten-minute exfoliating facial to revitalise and tone. The scientifically developed formula delivers a specified blend of 30% Alpha Hydroxyl Acids (Glycloic, Lactic, Tartaric and Citric) as well as 2% Beta Hydroxyl Salicylic Acid. The pair have been carefully pH balanced for optimum efficacy, working to deeply exfoliate the surface layer of skin, unclog pores, combat blemishes and visibly improve uneven textures. Plant-derived Tasmanian Pepperberry helps reduce irritation associated with acid use, while a cross-polymer form of Hyaluronic Acid seeks to alleviate dryness and discomfort. Vitamin B5 encourages healing and antioxidant-rich Black Carrot tackles free radical damage. Please Note: This formula contains a very high concentration of free acids. 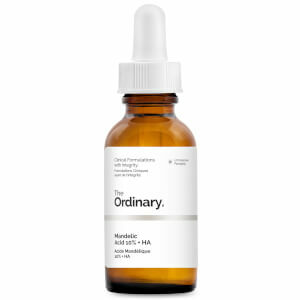 We recommend use only if you are an experienced user of acid exfoliation and your skin is not sensitive. Use ideally in the PM, no more frequently than twice per week. Clean face and wait for skin to dry. Do not use on wet skin. Apply evenly across face and neck using your fingertips. Leave on for no more than 10 minutes. Rinse with lukewarm water. Avoid the eye contour and contact with eyes both during application and rinse off. This low-viscosity solution is intended to be used as a masque. Do not leave on for longer than 10 minutes. If persistent irritation occurs, discontinue use and consult a physician. I have clogged pores under my eyes, I don’t believe to be milia but could have been. 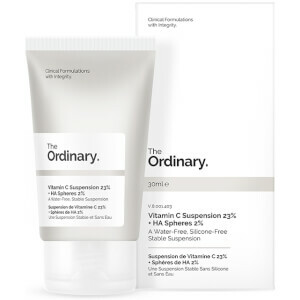 I started to use this product twice a week along with the yes to tomatoes detoxifying charcoal cleanser twice a day and after 2 weeks of use, COMPLETELY GONE! My clogged pores are so minimized that they are barely noticeable and I am happier than ever with how my skin looks! This has helped immensely with the texture on my skin (although it was never horrible but noticeable). I am a lifetime customer of this product for sure. HIGHLY recommend! I love it, it makes your face so bright and glowing. Good product, but be careful!! Ok, we all agree this product is a really good one, I prefer do it at night because this make my skin very sensitive and I don’t want to get sunburnt. Be VERY CAREFUL when you apply this on your face and neck, please DRY your skin throughly, if you leave water this is going to burn you, but really burn, not just tingling or a little red, I don’t know how I left my skin a little wet once, and I had a really bad time with my face, and also hurts, so, make sure you’re following the instructions. I wish I could show you a pictures of my face. I have suffered from acne scars for the past 13 years. I have tried every product and spent SO much money and nothing ever worked.. until now! I have been using this twice a week for a month now and the results are simply amazing! Everytime i use this, my deep scars are a little less deep and alot of them have disappeared! I have never been so happy with my skin! I was hesitant because i consider myself to have sensitive skin but i have had zero problems. I would recommend this to anyone with scars! I'm going to keep using it. I've been using this product 1-2x a week for about 3 weeks. It is easy to use and seems to be making a difference in the overall appearance of my skin. I feel like I need more time to give the most honest review, nothing works overnight. Follow the directions and be sure to spot test as this is an intense treatment and does sting a little. Also be sure you apply to completely dry skin. Wait a good 10 minutes after you wash your face before applying. It has caused a little bit of redness to my skin but I've been applying a calming moisturizer afterward that seems to help. I have oily skin that has began showing some signs of discoloration around my mouth. I have been using this product twice a week for a month or so and it truly works. My fiends have noticed and are amazed. I also began scrubbing my skin after rinsing off to give additional exfoliating effects and it has expedited the effects. It works! No doubt. Can’t wait to try other products they offer. Just got this, used it once, hooked. It’s a little scary at first because it definitely has a tiny tingle/sting to it. Nothing bad by any means, but you can feel it working. Just left my skin SO SMOOTH. Definitely less texture when I applied makeup the next day. I have super dry skin to where even after I apply moisturizer I still have dry patches. This was my first time trying a chemical exfuliant because I realized scrubs were not meant for your face. I absolutely love my result with this product, no scrub has ever exfuliated my skin like this. I have no dry patches the day after I use this chemical exfuliant and my makeup application looks amazing because it helps get rid of texture as well. The besttttt product, I definitely recommend!